Please remove my email address from your PR lists. totally stopped working. Turns out that a lot of these PR companies have a single database of random blogger emails they’ve snarfed up, but each employee seems to maintain their own personal list. When I ask Alice at example.com PR to remove me, I noticed a week later I got another PR blast from Bob at example.com PR. Then Steve at example.com PR hits me again a day later. So for now, I’m moving to filters in Gmail. The entire PR agency domain goes into the From: and you set it to delete immediately. Instantly, no more PR spam from Alice, Bob, or Steve, forever, and I don’t have to ask to opt-out of something I never opted into. And to people working in PR, some bloggers do seem to post the things you send, but in four years of daily PR email blasts that now number in the thousands, I recall one or two being something I was actually interested in. That’s about the same success ratio of general email spam over the past 10 years for me. update: I was thinking of posting my own blacklist of annoying firms, but it looks like Gina from Lifehacker beat me to the punch. the perfect PR person would match me up with topics I write about and when they figure out a perfect product pitch I might be interested in, email me personally once to share it, and ask me for confirmation if Iâ€™d like to get future email from them. Unless I reply back with a “yes” don’t add me to a list or pitch me again — it’s a not a good match and is only going to build frustration on my end if you keep sending unsolicited pitches. Well Jeremy, since I’ve never gotten a single followup from hundreds of PR people, I’d say you are in the minority, but really if you’re doing follow-up, then you’re asking for forgiveness after the fact when the best approach would be to ask first. So I’d say the perfect PR person would match me up with topics I write about and when they figure out a perfect product pitch I might be interested in, email me personally once to share it, and ask me for confirmation if I’d like to get future email from them. But don’t add me to a list based on keywords, it’s still spammy. How do we filter the Tweets and blog posts as PR appropriates Social Media? Looks like Jeremy beat me to the punch. Please have a listen to an interview I did with Andrew Warner of Mixergy. It’s about reaching out to bloggers in a manner that is both respectful and conversational. As a rule, our company only contacts bloggers with content that is relevant and informative. No press releases – just one-on-one communication. Actually, that’s exactly what my firm does. Every single piece of outreach is considered against the individual blogger/journalist. While yes, you are on “a list”, that list is filtered for each story/writer combination. So if a blogger has written about, say, issues the newspaper industry are facing, we might bring Spleak to their attention, but not Splashtop. Similarly, a gadget blogger is going to hear about Bug Labs, but not a semantic Web aggregator site we’re launching soon. Also, we do follow-up to learn whether or not a given writer is interested in a specific segment, and make note of it for the future. Bottom line is the only way you end up on a “definite followup list” for a given story is if you write about that given company (on our assumption that you’d be interested in them again). It’s not *perfect* I’m sure, but I like to think we are handling each individual with the respect for privacy/noise abatement that they’d want. Filtering is obviously a good way to make it stop. There is a more radical solution. Call the CLIENTS of the PR firms and tell the director of communications there that the firm is spamming you. At least that’s what I told mom bloggers to do last year. Funny, rule #1 of pitching bloggers is “don’t spam.” By the same token I’ve had bloggers who ask to be kept posted blast me for spamming them when I send relevant updates. Spam if you do, damned if you don’t. Why set up filters instead of marking as spam? I’m comfortable with marking any unsolicited email as spam — less work (in the short term anyway) than setting up individual filters, and it imposes a cost on flacks^H^H^H^H^Hspammers. I still find it extraordinary that PR folks have such a ballsy sense of entitlement about “reaching out” to one-person publishers and indie bloggers — it’s this ridiculous kabuki where they pretend like they’re performing some kind of essential public service. Well, it’s not a service (it’s a *paid nuisance*), and I’m tired of being expected to pretend that it is anything but white collar spam simply because my email address can be easily guessed and you happen to know my first name. Thing is: PR folks are being compensated to nag people for free publicity, and if I indicate (very publicly and repeatedly) that I don’t care to be “reached out” to, it just seems like common sense and decency to leave me the heck alone. Take the business elsewhere. The people who _pay_ the more rodent-like PR people need to know what’s being done in their name and how it’s likely to affect their hard-fought reputation. It’s crummy and unprofessional work, and, if it’s not clear, I’m sick of spending hours a week politely asking people to knock it off. At this point, and with much reluctance, I’m ready to take up the torch and pitchfork. I love Gmail. Their spam filter catches a lot too, less work for me. I am so sick of people flakking for gmail by saying its filters will help me avoid getting PR flak email . . . oh wait. Nevermind. I’m tracking all this back from a single Twitter through two other sites. Blacklists have been and continue to be used in the ISP industry. They aren’t without fault or controversy of course. However, one cannot deny that a blacklist cuts down on the amount of email one might get otherwise. This blacklist just appears to be a lot more, well, personal and right hand rule oriented. It’s your inbox. Do what ya gotta do! 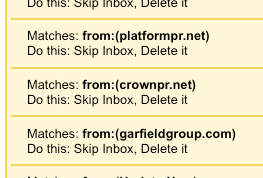 I recommend actually marking these messages as Spam in Gmail as well. So instead of skipping the inbox and deleting it, skip the inbox and label it. Then occasionally view that label, select all messages and mark as spam. My guess is that your email has gotten put into a media database like Bacon’s/Cision (http://tinyurl.com/5dkyna). Publicists use that to pull a list and send out their releases. You then ask that publicist to take you off the list, but they are not in control of that giant media database, so your request goes no where. Each subsequent publicist pulls from the giant database. I’m not excusing it, just trying to help you understand the situation. Maybe contacting Bacon’s could get you off lists. Or just keep sending straight to delete, that works too. As an aside, is anyone getting a continual 600 error with Gmail trying to make it choke down this huge list of from addresses? Will it go away eventually, or does this not work? –I will admit story idea is a bad turn of phrase–it is all about building relationships. I just find it interesting that there’s all of this hate for PR people, and no acknowledgement of the good stuff. There are plenty of bloggers who will cover your stuff and who are open to hearing about new things from flacks. Know what? Reaching out to bloggers is risky and scary, because any mistake you make will be disclosed with all of your information to the whole wide world, potentially harming your PR career. It’s not all cotton candy and pony rides on this side of the fence, especially when there are a lot of us out there really trying to engage bloggers in a way that is interesting and comfortable for them, and ethical for us. Fair enough, Megan. “blogger outreach” can be risky, and getting slammed like that isn’t fun. I work at a firm that really supports me when I have to push back on a client and explain a bit about social media. I think a smart way to approach it is thinking of blogger outreach more as ally development or relationship building than “media relations.” That way you can effectively manage the expectations of the client – you’re not measured by the number of “hits” you generate, but on the quality of the people who want to know more about your clients. You don’t have to worry about spamming bloggers with stuff they’re not interested in reading, and most importantly, you can sleep well at night. A lot of clients just want “placements” on blogs. I tell them they should seriously consider buying an ad on the blogs they think are important. Sometimes that doesn’t go over well. But I’m giving the client the best advice I can, and I’m not getting people like Matt here upset with me. It doesn’t always work and I’m by no means perfect but I can sleep well at night. I will admit story idea is a bad turn of phraseâ€“it is all about building relationships. ick. That’s an even worse term. I have a “relationship” with a PR person like I might have a “relationship” with a stalker — it’s a one-way street all the way. Building on what Merlin said and what Kim mentioned I’m actually growing more and more pissed off at the PR industry as I get these spam messages each day based on the fact that some company sold my email and PR people are getting paid to annoy me. I just find it interesting that thereâ€™s all of this hate for PR people, and no acknowledgement of the good stuff. As I said, I’ve gotten thousands of these since about 2003 and one or two products mentioned were actually something I cover and up my alley (but then I would have found out about them on my own). Everyone I know that blogs and has been doing it for a long time is inundated with these PR emails they didn’t ask for or sign up for. I could see someone new to blogging with a gadget site on blogspot willing to publish anything at all related to their topic of choice, but among the bloggers I know personally and follow, they write original pieces for the most part that don’t require PR wire information or they’re filtering through thousands of news sites looking for the interesting nuggets worth sharing. Just wanted to drop a “here, here!” on this post as a blogger that can definitely attest to the ridiculous behavior that you describe in the post (and an already good comment thread). I regularly get the same press release twice, sometimes on the same day, sometimes the next day from a different source, and I’ve yet to fully take action to deal with this noise in the way you have. I know it adds up, though — and this post has inspired me to start filtering out the junk and marking stuff as Spam that was clearly unsolicited. Thankfully I wasn’t totally diluted for *that* long. But I think it’s odd that you believe that developing a relationship with a public relations practitioner is akin to developing a relationship with a stalker. The same sort of relationships that David was talking about are abundant in the world of business; people engage in relationships because they are mutually beneficial (funny how business relationships and personal relationships are strikingly similar). PS: I was pretty surprised to see SHIFT Communications on the list because I know they make painstaking efforts to accommodate bloggers. Any thoughts? Hi Matt – I empathize with all your concerns, I truly do. And I was glad to see @Bryan give SHIFT some props cuz we are as scrupulous as possible about how we reach out to both media & bloggers. Mistakes and misunderstandings happen, though. We can only promise to improve, and I hope you’ll be patient with all of us in the PR industry. The majority of PR pros are pretty nice, funny, cool folks who have no desire to spam anyone. Well, I’ve been writing about tech for 20 years. I’ve been blogging for about 4 years. I get hundreds of unsolicited and off-target emails from PR companies every single day. And if took the time and effort to track down each email and filter out each company that sent it, two things would happen: 1. I’d have wasted half a day being totally unproductive, and b) I’d eventually miss out on products or services or information that will help me down the road. It is an annoyance. But I don’t consider it spam. I’m a journalist; I’ve elected to be included in the various media directories — it comes with the territory. And if you’re a blogger who relies on PR folk to supply you with info and products, it comes with your territory too. Instead of whining, why not simply scan the subject lines and hit Delete? If you get called from someone with an off target pitch, why not tell them what it is you do cover? I’m not usually one to defend PR people, and I’ve experienced more than my share of Stupid PR Tricks over the years, but I do not envy them their jobs. In an era where there are tens of thousands of bloggers asking for product, can you really expect PR folks to keep track of every single blog and its specialty? Imagine being on the other side of this for five minutes. How would you do it? I think you need to cut these guys some slack, imnsho. hey – if you’re interested, go to http://www.bloggersandpr.com to register your complaint and offer suggestions directly to the industry. Whether you’re a public relations person or a blogger, the issue is same – unwanted email. I’m in public relations with a technology company and I regularly receive spam, inspite of multiple filters. It’s a nuisance that requires more of my time to sort to find the emails I want to read. From bloggers, the message is clear – make it personal and relevant. I love gmail. On the topic at hand, it’s all about personal relationships, ain’t it? You should never send out any kind of email to mailing list that doesn’t have a nice big unsubscribe link in it, because this is what happens.